In many states Chelsea-Bradley wouldn't be able to buy a gun or work in certain job titles because of his-her felony conviction. But, he-she can run for the Senate? Doesn't say much about the Senate does it? 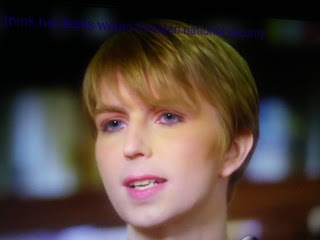 NY Post reports Chelsea Manning, the former Army private convicted of leaking classified government documents to WikiLeaks, is running for the U.S. Senate in Maryland. Manning, a 30-year-old transgender woman born as Bradley, filed candidacy paperwork with the Federal Elections Commission on Thursday, the Washington Post reported. She was convicted in 2013 of 20 counts for releasing more than 700,000 classified government documents and sentenced to 35 years in prison — the longest sentence ever imposed in a leak case. She was released in May last year after serving seven years, when President Obama granted her clemency.